The opening race of DAY 4 of the Cheltenham Festival is the Triumph Hurdle and leading UK bookmaker Ladbrokes is offering an unmissable offer to start the Gold Cup Day with a boom! Get 50/1 Apple's Shakira to win (was around 7/4) and £5 free bet if your first bet loses! APPLE'S SHAKIRA made a very nice impression when winning in France. She was quickly snapped up by JP McManus and has since won three races, all at Cheltenham. She is unbeaten in her 4 starts so far. Claim this massive price boost via this page, from your desktop pc, smartphone or tablet... wherever you are! Ladbrokes offer 50/1 Apple's Shakira to win the Triumph Hurdle at Cheltenham! 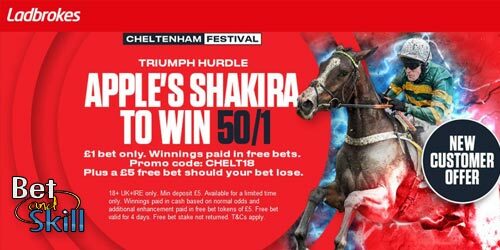 Join Ladbrokes via our special links and claim 50/1 for Apple's Shakira to win the Triumph Hurdle! 3) Place a single bet of up to €/£1 on Apple's Shakira to win in the Triumph Hurdle 2018 race winner market before the race starts. 4) If Apple's Shakira scores, your account will be credited with extra winnings (paid as free bets) within 24 hours. 5) If your bet loses, you will get a £5 free bet as consolation prize! Apple's Shakira is backable at 7/4 with almost all online bookmakers and her odds are shortening. This price boost promotions is available only for UK and Ireland customers. 18+. "Get 50/1 Apple's Shakira to win the Triumph Hurdle 2018 at Ladbrokes"